You can have them choose their own activity, but I had them just having lunch or dinner, sitting at a table. The first two people who talk respond to each other directly and talk about the same topic. The third person just listens to their conversation. Eventually, the third person chimes in, but talks about something completely different from the other two. Whenever the first two people talk, they are talking about their original conversation and whenever the third person talks they are talking about their own topic. Everyone should listen to each other and should react honestly to how it feels to have this kind of conversation. From here, the scene could go in lots of different ways. Perhaps the conversations could merge, or the third wheel could keep trying to merge the conversations and failing. Since we only did it a couple of times, I’m not sure what all the variations could look like. I’m realizing that a major theme in my improv thinking these days is how important surprises are. 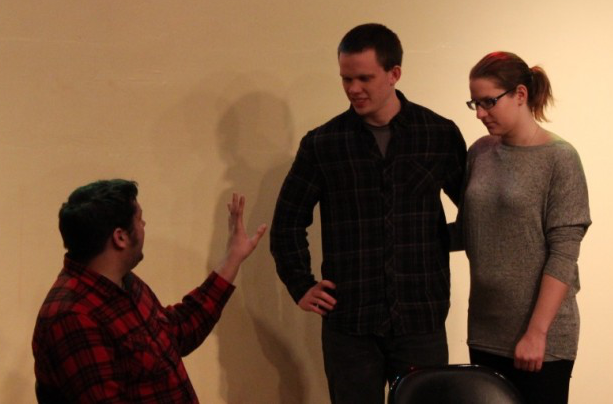 The dialog of improv scenes is often way to linear and gets stuck on whatever topic the players start with. Non sequitur is one tool to fight this tendency. Please let me know in the comments if you try this and what your thoughts are. Also, please take a look at my other posts on scene templates.